Stone has been profiled in the Weekly Standard, The New Yorker, and the Miami Herald in 2007 and 2008. 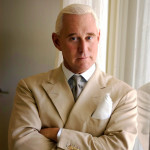 Mr. Stone has written for the New York Times Sunday Magazine, The New York Times Op Ed page and for Newsmax.com. He has appeared frequently on FOX News, NBC Nightly News, CNN, MSNBC, and the Today Show. Stone is the editor and publisher of STONEzone.com.